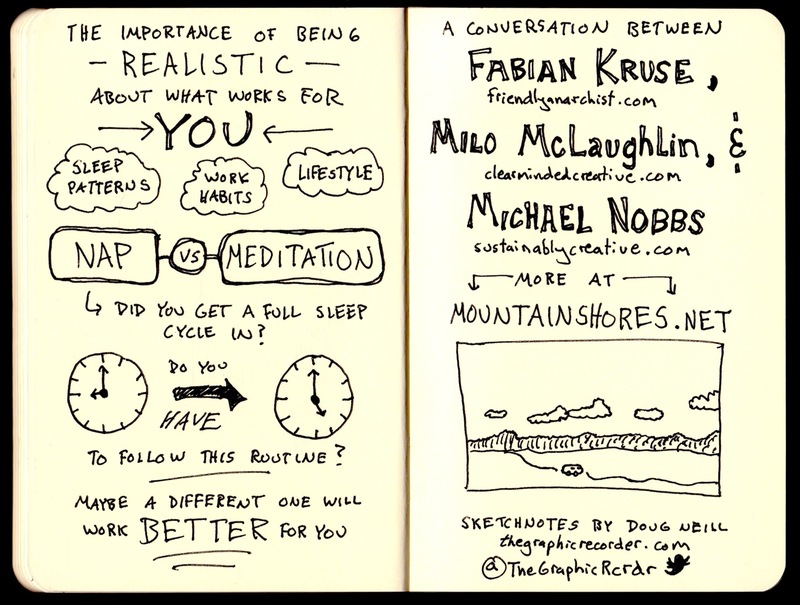 There were so many interesting topics discussed in this Mountain Shores podcast featuring Fabian Kruse, Milo McLaughlin, and Michael Nobbs. 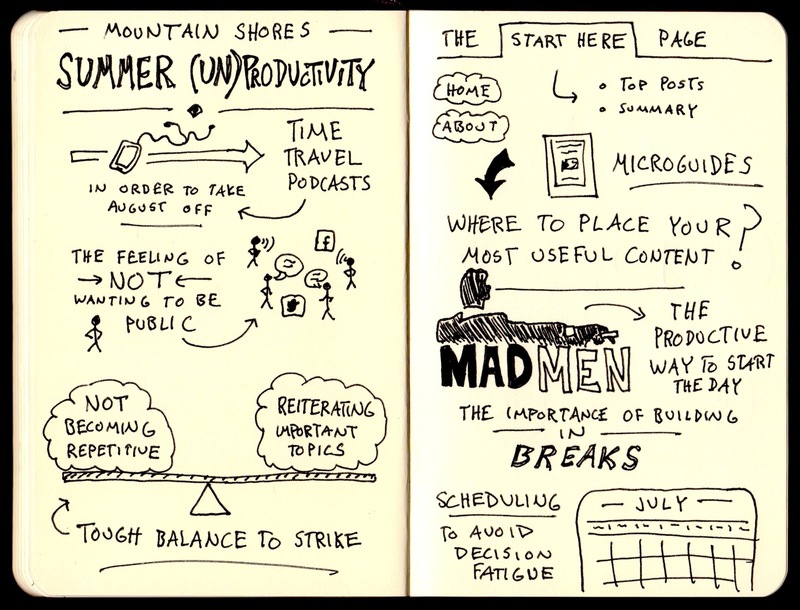 In the sketchnotes below I captured some of the highlights for me. Read on below to see some of my reactions. For me the most pertinent discussion focused on the idea of setting up routines that fit your lifestyle and your work style. I like routines but I also crave variety. In the past I have found routines that I enjoy, but within a week or two I tire of the current routine and feel the need to switch it up. Maybe that regular adjustment to my routine is just a reality that I need to get used to. That routine usually takes me from about 7 in the morning to 10 or 11, at which point I take my first significant break of the day to get outside, maybe go for a run, take a shower and have lunch. I then have my afternoon free to do whatever I feel my body and mind need. Many days that means heading out to a coffee shop – the social interaction and ambient noise (not to mention the caffeine!) can be very energizing. What I like about this routine is that I get my core things done right away. By starting my day with lots of writing and a complete sketchnote (before email, Facebook, Twitter, or anything else) I feel both a sense of accomplishment and usually a good amount of momentum to propel me through the rest of the day. But who knows how long this routine will suit my fancy. Only time will tell. Many other topics peaked my interest in this show – like time-traveling tweets, a discussion on ‘Start Here’ pages and site layout, and even an afternoon nap vs. meditation debate. But I think that’s enough reflection from me for now. I’m at the end of my morning routine and my stomach is starting to growl. Time for lunch.